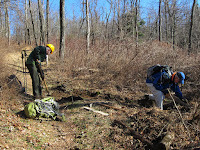 Plans to help other Appalachian Trail clubs with maintenance of trails in wilderness areas fell through, so with recent mild weather, we went to continue drainage improvements on the Appalachian Trail north of Doyles River, where for the past several years, we have been restoring and creating drains and regrading short sections to slow erosion. Like our trips last year, it was a trio, this time John Shannon, Don Davis and Dave Borszich, all with experience at this work. This trip felt more like a routine maintenance trip, clearing out existing drains, including cutting briars and removing other obstacles in the runoffs, and incremental improvements of runoffs rather than restoration of drains full of material that had collected over a long time. Last year we found a gully in the trail after heavy rain. Eileen Seaman filled it, and Don Davis identified the cause; a year later, we saw that we were successful. Just before noon, Lindsay Brown and Ken Moss joined the others after removing several blowdowns on Lindsay's section of AT south of Riprap Trail. They removed a log that obstructed one runoff on this AT section as well. We also saw overseer Connie Wright who had done some work, but left the heavy clearing for the group of younger people. 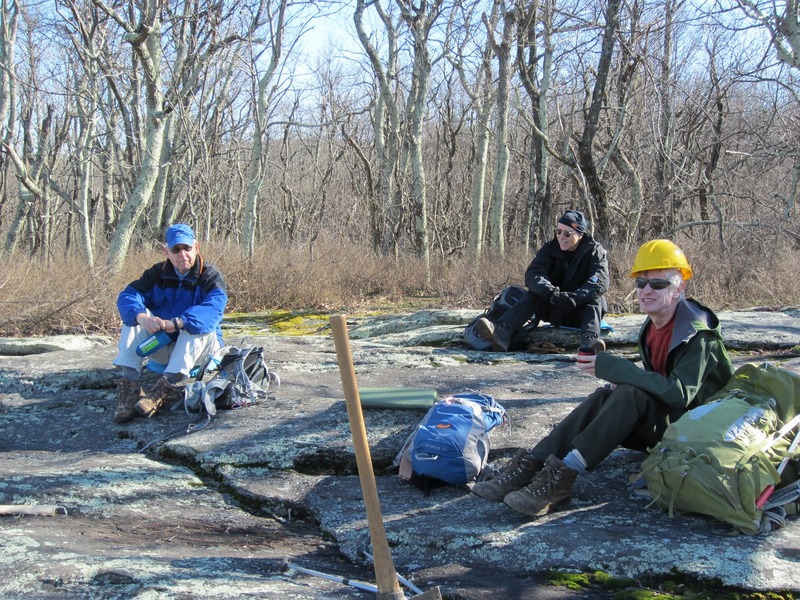 After lunch on a nice rock outcropping, fortified with pumpkin cake, the original trio kept heading north while Lindsay and Ken headed to family obligations. We went further along the trail than we have in previous trips, thanks to previous efforts which made the waterbars easier to clean. We made a couple of extra drains and short sections of regraded trail to improve drainage. Perhaps these new drains will need more work in the future, but it was a start. John also noticed some bittersweet to cut or pull, which will probably not kill it, but will slow it down. When there are leaves, it will be easier to see the bittersweet, and damage it to stop tree strangulation. 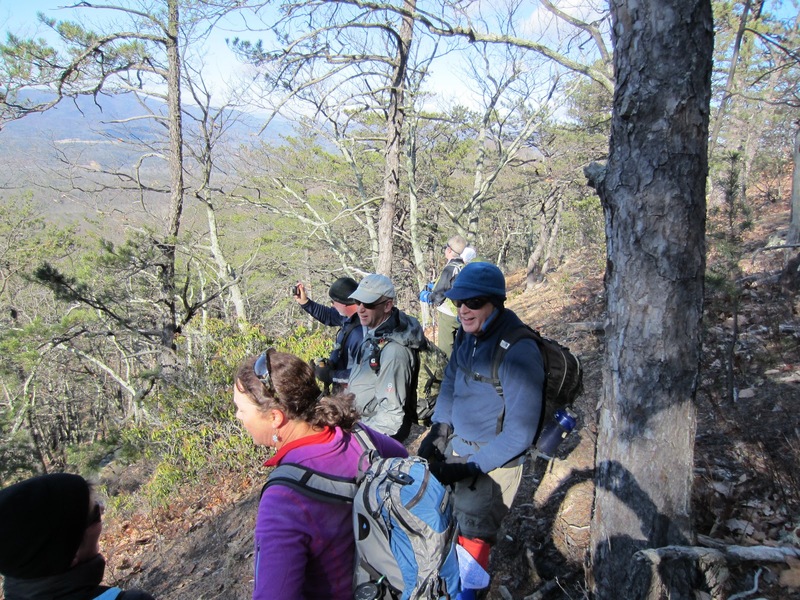 While numerous members of PATC - Charlottesville Chapter took a hike to Turk Mountain, John Shannon tended to drainage on the McCormick Gap and Rockfish Gap ends of the Chapter's section of the Appalachian Trail. Most of the work was clearing leaves out of water bars, with minor removal of earth, and a little regrading to improve drainage. John also pulled some garlic mustard, hoping to reduce the amount that reaches maturity in spring. 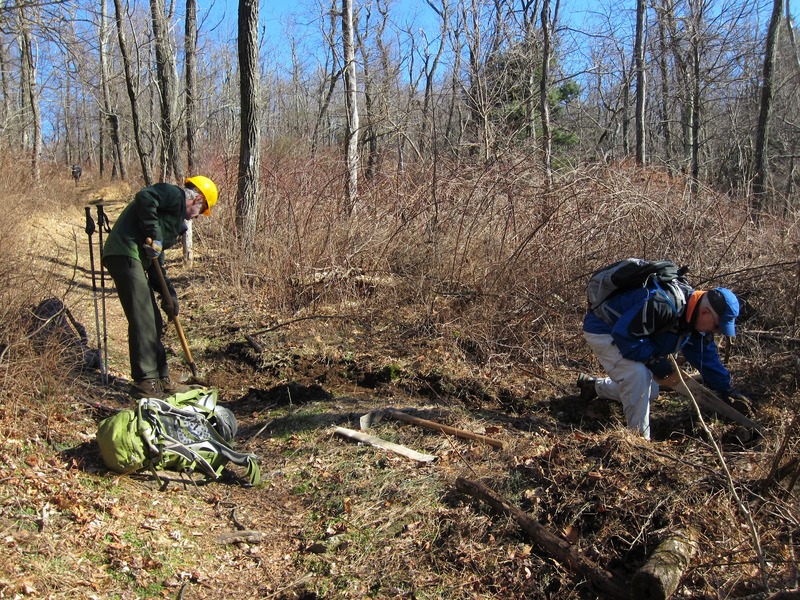 John Brandt joined at McCormick Gap and was sent to remove a log which was in the trail corridor but not blocking the trail; he did not find a log to cut, but did find a log to push off the trail, so that nuisance is finally gone. 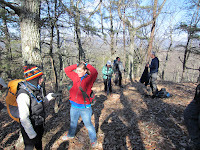 We collected at 9AM in sub-freezing weather expecting to find maybe 5 or 6 hearty souls up for a cold hike. Surprisingly, there were 16 of us at the high school meetup spot. Included in the total were dual hike leaders Iva Gillet and Jeff Monroe, as Iva had been pushing Jeff to quit talking so much about great hikes and start leading a few. Iva brought a few folks from the Outdoor Social Adventure Club, Megan McFadden and Steve Cohen. Dan Ralston brought his daughter Anne, who is preparing for a marathon, while finishing up her Ph.D. work with an internship in Charlottesville. 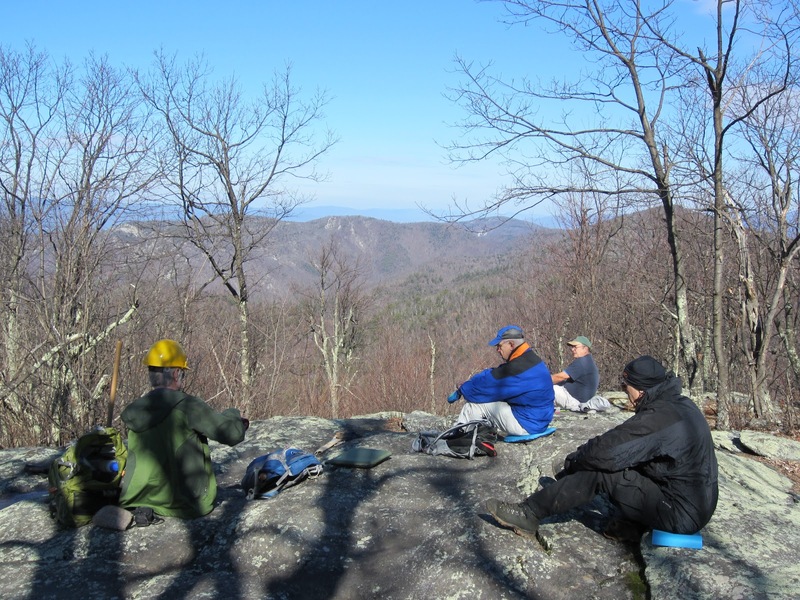 Others included hike leaders Ken Moss, John Shannon, Andy Willgruber (who recently ascended to hike leader), and regular hikers Don Davis, Bill Holman, Dan Funkhouser, Liz Lyons, Rita Kieffer, Joanne Davis, and Dave Borszich. Not on the list was Nancy Hall, due to meet the group at the top of the mountain, and Bryce Allison, who is one of the guys behind the best Virginia hiking website in existence: hikingupward.com. 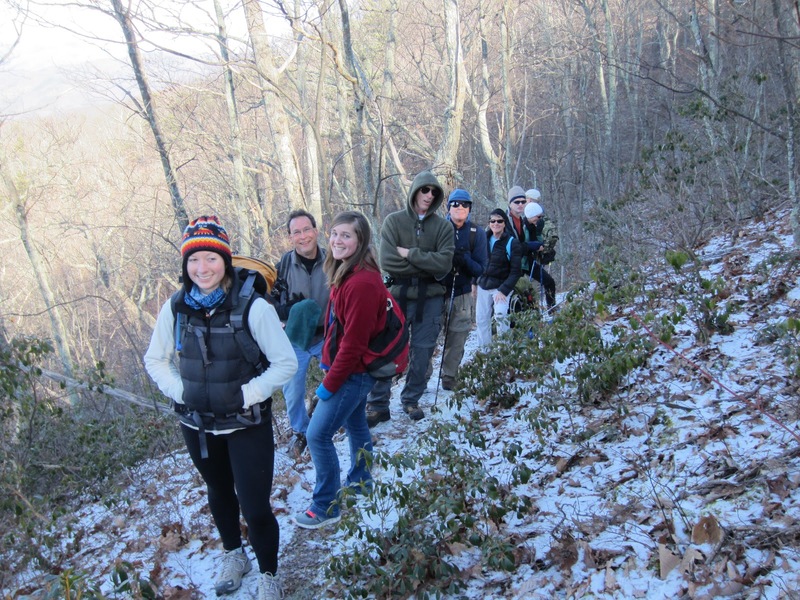 Bryce had asked online about hikes out near Harrisonburg that would be new ones for him, and we were excited to have him join us. 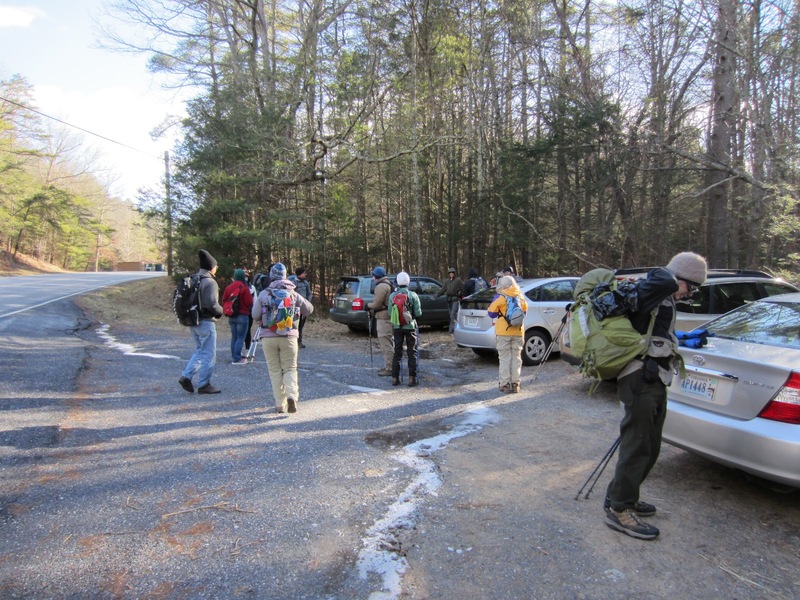 We stopped in Churchville so some folks could get provisions, then pulled into the trailhead parking lot at the exactly 10:30. After some quick introductions, we hit the trail. 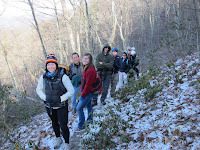 The trail starts through a beautiful ravine with healthy hemlock and large white oak. There were multiple stream crossings over water that had swelled due to rains earlier in the week, creating quite a challenge for those with shorter legs, though no one’s feet got wet. About a mile into the hike, though, the trail left the ravine and started up the mountain slope at an amazingly consistent rate of 16%. We topped one ridge, walked along it, then traversed the western slope of the mountain (marveling at views of Shenandoah Mountain and the Deerfield Valley) until we reached Coalpit Knob and another ridge. After leveling out for a while, the trail soon had us back on a 16% grade until we reached the top of the mountain and the end of the trail. The trail's consistent climb had to be by design, and the trail was very nicely built and well maintained. There were very few blowdowns and there was evidence that some folks had taken saws to several large trees that once blocked the trail. At the top of the mountain we all settled in for lunch. There was the usual sharing of food- pumpkin bread and molasses cookies, and chocolate. Due to the cold temperatures, we did not linger long at lunch. Bryce bid us farewell as he had to be back at JMU for his daughter's music performance, and not 5 minutes later we saw Nancy coming up the trail from the opposite side of the mountain, via the Crawford Knob Trail. We decided to go back the way we came rather than using Nancy's car for a shuttle, as the Crawford Knob trail she reported to be very rough, so we headed back down the mountain with Nancy after promising her we would give her a lift back to her car. Bryce later put several very nice photos of the hike on Hiking Upward's Facebook site for all to see. John Shannon had a brief period of fright when he realized his trusty GPS was missing. As with other technology lovers in our group, he was eager to retrieve the valuable devise, and fortunately was able to reclaim it without an extensive search in the cold temperatures. 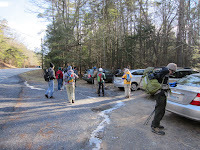 The hike started out at an elevation of 1945 feet at the parking lot and rose to 3855 feet at our lunch spot. It lasted a hair over 4 hours including about an hour for stops, and was 7.5 miles long. It was the perfect length for a cold winter day with enough climbing to keep us warm. 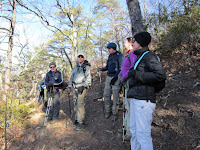 We enjoyed the lovely views which winter provides and the chance to stretch our legs with new and old friends. Another great day to be out in Shenandoah National Park. 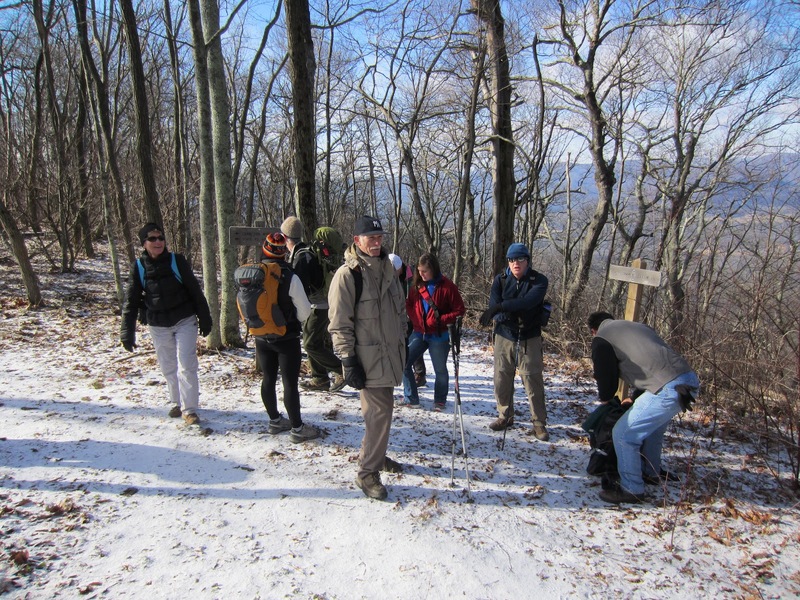 16 hikers joined leader Lindsay Brown for a short but fast hike from Wildcat Ridge Parking area south on the AT then on to the summit of Turk Mountain. Lindsay needed to make the day short in order to make a 6 PM UVA basketball game (Hoos won a close one). We were fortunate to have two new hikers on Saturday, Vicky Ingram and Laurie Keenan, and we hope to see them soon on another hike. 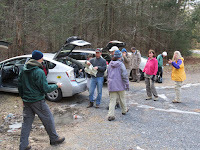 Michael Seth from the PATC - South Shenandoah Chapter was also present and lead a fast pace as we left the parking lot. Don Davis volunteered to be the sweep to insure we didn't lose anyone, thanks Don and good job. 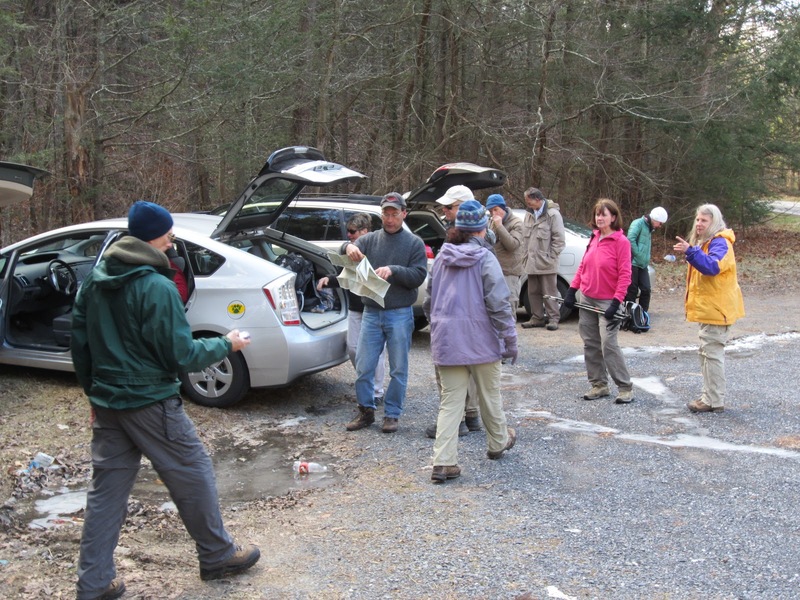 Other hikers included Dave Borszich, Bev and Pete Fink, Sue Tansey, Dan Funkhouser, Marian Styles, Leon Gorman and Bailey, Ken Moss, Briana Taylor and Maynard and Joanne Davis. 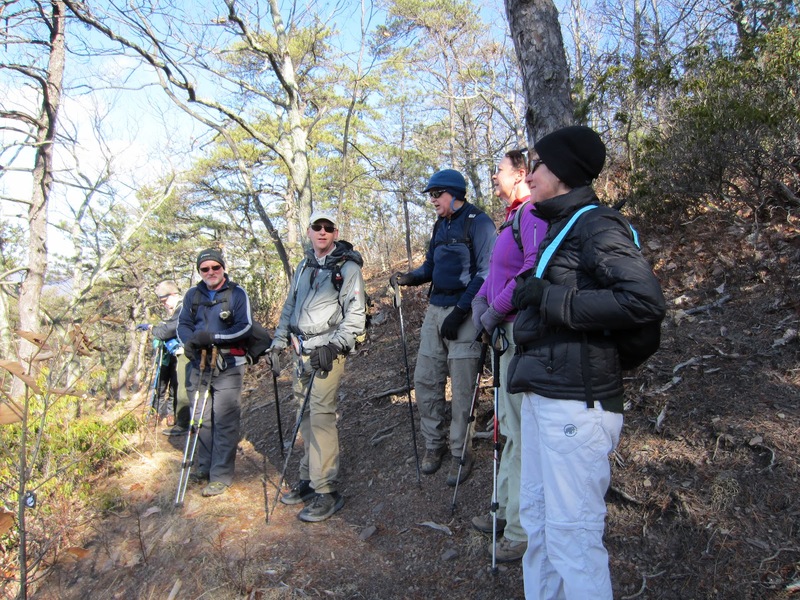 We did see John Shannon headed into the trail at Rockfish Gap to do some trail maintenance. Way to go John!!! 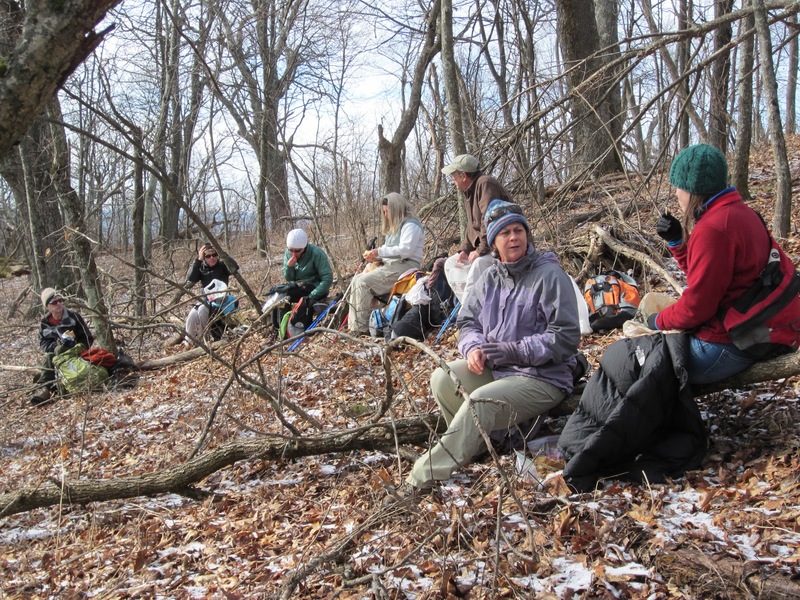 An easy 6-mile hike on a balmy December day enticed some 21 people out on New Year’s Eve. 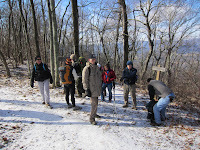 This hike marked Andy Willgruber’s debut as a PATC hike leader, and he was assisted by veteran Iva Gillet. Andy has done a lot of work on the Fluvanna County Heritage Trails, which offer both hiking and equestrian trails, some with views of the Rivanna River. 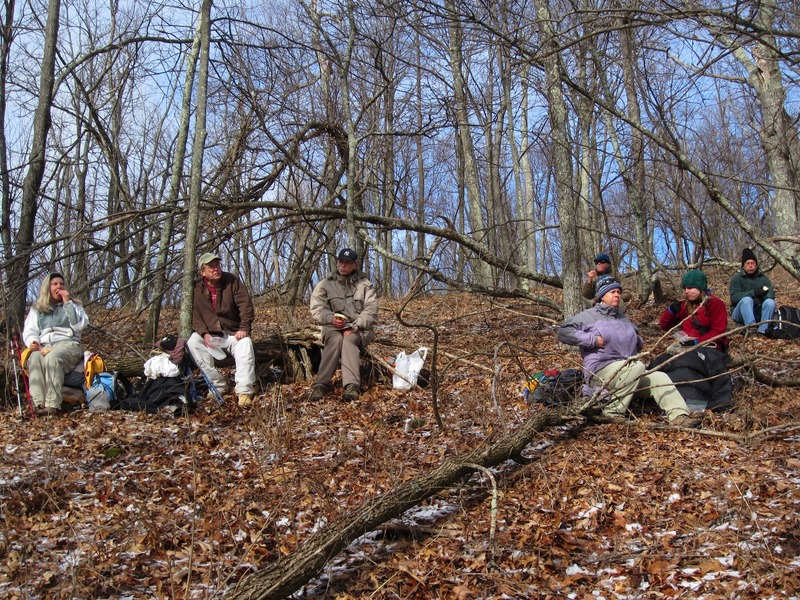 Some of us were familiar with the area because in February 2005, members of PATC – Charlottesville Chapter joined Andy to work on the Rail Trail on the opposite side of the river from today’s hike. Andy gets an A+ for accuracy with his warning that the trail would be muddy. Recent rains ensured that the route was indeed squishy. 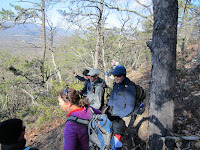 Mud proved a minor inconvenience, though, when compared with the scenery, spring-like sunshine, and fine group of hiking companions, some hiking with the club for the first time. We stopped for lunch at a shelter with picnic tables. Andy shared chocolate treats, John passed out cranberry cake, and Iva distributed brownies and holiday cookies. We completed the hike at about 2 p.m. Those not in a hurry stopped off at the Gypsy Gourmet Cake Lounge, where they had a choice of Chap’s ice cream, Greenberry’s coffee, and an assortment of yummy baked goods. Might be worth a repeat hike so we can make another stop at this unique place! 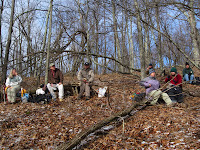 In addition to the two hike leaders, participants included Wanda Hamlin, Joanne & Maynard Davis, Dan Funkhauser, Marian Styles, Kim Pingatose, Barbara Sheneheld, Pete & Bev Fink, Ken & Marie Moss, Briana Taylor, Tricia Neoness, Dan Ralston, John Shannon, Leon Gorman, Don Davis, Dave Abdalloh, and Jodi Frederiksen.